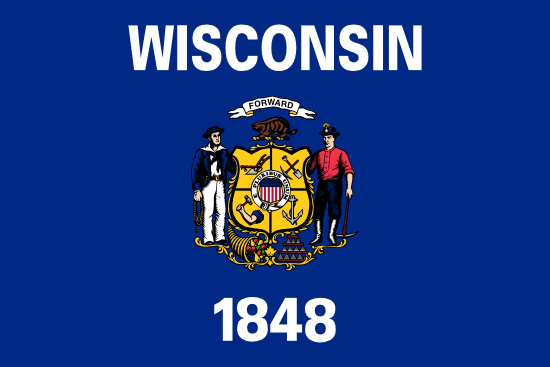 Wisconsin has no official state nickname, but it’s routinely referred to as either the “Badger State” or “America’s Dairyland.” The latter is especially apt, as the state ranks second throughout the U.S. in butter and milk production, as well as being responsible for 25% of the nation’s cheese. While I enjoy a slice of cheese as much as the next guy, the purpose of this article is to discuss the sports betting opportunities that exist within in the state of Wisconsin. Just keep in mind that I’m not a lawyer, and any serious questions about the legality of gambling should always be directed to a paid professional. Most gamblers prefer to wager on professional or college sports, and Wisconsin has some solid options for each. In this section, we’ll take a look at the three major league teams in the state, as well as minor league and semi-pro franchises. • Green Bay Packers – The Packers compete in the National Football League and have won the Super Bowl four times. Their success has earned Green Bay the nickname of “Titletown USA,” and more than 80,000 people are currently on a waiting list to get season tickets. If you want to place a friendly bet against the team, you should have no trouble finding a loyal “Cheesehead” who’s willing to take that action. • Milwaukee Bucks – While ranking last in the NBA in current value, the Bucks still manage to pack fans into the BMO Harris Bradley Center on a regular basis. Since they were founded in 1968, the team has captured one league title, two conference titles, and 13 division titles. Notable stars to have played ball in Milwaukee include Kareem Abdul-Jabbar, Bob Lanier, and Ray Allen. • Milwaukee Brewers – This MLB franchise debuted as the Seattle Pilots in 1969, but they relocated to Milwaukee after just one season. As of 2014, the team has managed to put together a record of 3,501-3,818 for a winning percentage of .478. Their most successful season came in 1982, when they won the American League Championship (they now play in the National League) and advanced to the World Series before losing 4-3 to the St. Louis Cardinals. If you enjoy leagues with cheaper ticket options, I suggest investigating the wonderful world of semi-pro and minor league sports. While you’re unlikely to find online bookies willing to take action on these teams, you should have no problem locating a local bookmaker or superfan willing to take the risk. • Marquette University – While they lack a football program, the Golden Eagles have excelled at basketball over the years. They won the NCAA title in 1977, made it to the finals in 1974, and advanced to the Final Four in 2003. • University of Wisconsin – Green Bay – The women’s athletic program is notable at this university. The Phoenix basketball team has advanced to the NCAA tournament eight times, while the softball squad won the Horizon League championship in 2005 and then advanced past the first round in the national tournament. • University of Wisconsin – Madison – Arguably the most successful athletic program in the state, the Badgers produced notable achievements in both football and basketball. Their football team has won three Rose Bowl championships, and their basketball program has advanced to the final four in 2000, 2014, and 2015. In 2006, both their men’s and women’s hockey teams completed their seasons by winning national titles. • University of Wisconsin – Milwaukee – The Panthers compete in 15 NCAA sports, although they lack a full-time football program. The men’s baseball team has advanced to the NCAA tournament three times since 1999, while the women’s volleyball program regularly qualifies for tourney play at the end of the season. The men’s basketball squad made headlines in 2005 when they upset the heavily favored Boston College to earn a spot in the round of 16. While Wisconsin is often represented during March Madness, they’ve never managed to win a national title in men or women’s basketball. The Badgers have made it to the NCAA Basketball Final Four on three occasions, so hope springs eternal for an eventual tourney win. While the 1992 Professional and Amateur Sports Protection Act forbade land-based sports gambling in all but four states, it says nothing about online gambling. That’s not surprising, as the concept of the Internet would have been considered utter nonsense by most people in the early 1990s. The Unlawful Internet Gambling Enforcement Act is meant to hamstring online gambling, but its primary targets are virtual casinos and bookmakers operating outside the United States. That means the average bettor can wager all they want if they’re able to find someone to take their bets. As long as you’re not pulling in millions of dollars in profits, you have nothing to be concerned with. The most popular betting alternative involves turning to a fellow bar patron and saying something like “I’ll bet $50 that the Packers lose this Sunday.” That’s all it takes to get things started, although it’s important to make sure that all parties can cover their losses. Local bookies are also a good option, even though they’re obviously operating outside the law. They generally get their lines from Vegas or an Internet site, and their services are just a phone call away. And even if they get busted by the cops, odds are slim that it’s going to get traced back to you. While it’s not the same as living in Las Vegas, Wisconsin residents have access to plenty of solid sportsbetting options without having to contend with the oppressive desert heat. The Packers, Bucks, and Brewers have their lines posted at all major sportsbooks across the globe, and you always have the option of placing a friendly wager on local events such as cycling or minor-league baseball. And even if you lose, you can always drown your sorrows in a tall glass of milk (with a slice of cheese on the side).